Details at the end of this post on how to enter to win a copy of A Cajun Christmas Killing. We also have a link to order it from Amazon, and from an indie bookstore where a portion goes to help support KRL. At the family’s B&B, there’s a nice family, a tour group of Japanese visitors, and one cranky man. Nothing seems to please him. Tug, Maggie’s dad, is usually an upbeat guy but lately he’s been downright grouchy. When he collapses at the bonfire site, hospital tests show his blood pressure is sky high. Bad news about the B&B has only added to his stress. A hostile takeover of the family business might just put them all out on the street. Maggie finds out the cranky man is really Steve Harmon. He’s behind the takeover, using bulldozer tactics, spreading rumors, and making sure negative reviews show up on travel advisor sites. Once his secret identity is exposed, he’s all over town. Maggie’s mom was a Ducet. Her former home was gifted to the state in order to preserve its history. Maggie works there as a tour guide. There’s a new manager, Tannis, who seems awfully cozy with Steve. Even though she doesn’t have nearly enough time to devote to her paintings, Maggie’s giving Bo’s son, Zander, lessons. Steve decides Zander should be the next prodigy, but Bo’s not having any of that. Another surprise is the “art consultant” who is traveling with Steve. It’s Chris, Maggie’s ex. Well, if this isn’t just a mess and a half. When Steve’s body is found in the men’s parlor at Ducet, Maggie knows she has to help find the killer. Her family is likely to be on the suspect list along with a local dancer, his own relatives and more. The suspect list could go on and on. When a second death occurs and an attempt is made on Maggie’s life, it’s time to put the investigation into high gear and find the killer. This is the third book in the series. Maggie and Bo are a good match. Rufus, Bo’s cousin and the former police chief who was such a thorn in Maggie’s side, is on the sidelines due to a fight with the mayor over a parking space, but only until Bo himself is a suspect in Steve’s death after their argument about Zander. For a look into Southern life, a bit of history, and a really good mystery, this is the place to go. After reading about the meals Maggie’s mom makes for the guests, readers will be glad to see recipes for shrimp remoulade, muffaletta frittata, brandy pain perdu (similar to French toast), coconut pecan bars, and spicy Cajun sugar cookies. Byron also tells a bit about how real life experiences show up in the book. To enter to win a copy of A Cajun Christmas, simply email KRL at krlcontests@gmail[dot]com by replacing the [dot] with a period, and with the subject line “cajun,” or comment on this article. A winner will be chosen December 2, 2017. U.S. residents only. If entering via email please include your mailing address, and if via comment please include your email address. I’d love to read this. Thanks for the chance! I am looking forward to reading this! The previous two books were awesome with a few twists and turns which made me want to keep on reading. I’m sure this one will as well. Ellen is such a great author and knows how to keep you turning the page as well as introducing to the characters you love, and the characters you love to hate. Thank you for the opportunity. I love books that have a bed & breakfast in the setting. Thanks for a chance to enter this giveaway! I love Ellen’s Cajun and Seal books. I’ve read almost all of them and wish I owned some.. So maybe this will be the start of my Ellen Byron section of my home library. You had me with the cover – LOVE IT! I love cozy mysteries and Christmas stories but then you hit the trifecta with the doggie. 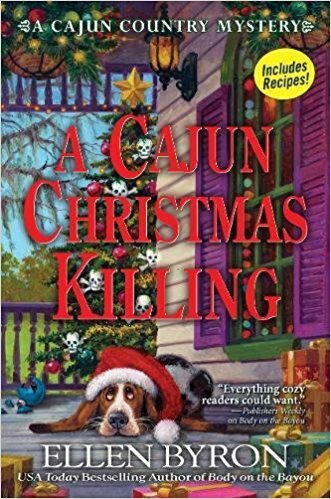 Thank you for the chance to win a copy of A Cajun Christmas Killing! I have heard such good things about this book so thank you for letting us enter. Love this series! “A Cajun Christmas” sounds like great read for the Holiday season. Read the first two books and fell in love with the series! Can’t wait to read A Cajun Christmas Killing. Thank you for doing the giveaway! Thanks for the chance. I would love to win this. Today is my birthday so maybe I will be lucky. The cover is gorgeous! I would love to read this! Thank you for the opportunity to win. This is a new to me series but I love the cover, with that sad dog in a Santa Hat. I really enjoy seasonal themed mysteries.